Truncating the title and adding a little addendum of his own to the story director Otto Preminger offer’s up a well polished version of Oscar Wilde’s, Lady Windermere’s Fan. A devastating Victorian satire in its day Preminger updates the opening to post war London with two of the now doddering principals drawn once again together over the fan re-kindling memories of when it first played such an important role in their lives. 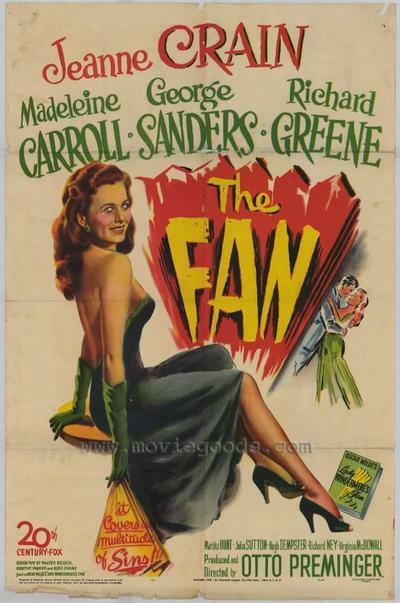 At an auction selling objects from bombed buildings Lady Erlynne (Madeline Carroll) attempts to reclaim a fan given her decades earlier. The auctioneer is reluctant to part with it on her say so unless she can find a witness. She goes and looks up “cad from the past” Lord Darlington (George Sanders) to vouch for her and after an initial re-buff the two recall the bell époque together and how his deviousness almost ended a marriage while her sacrifice saved it. Preminger seamlessly injects the war as a catalyst to springboard the play as well as add a sly touch that reveals itself comically at the end. With his ability to speak film language as well as anyone The Fan flows with long takes and fine performances by the principals Carroll, Jean Crain, Richard Greene and George Sanders who seemed born to play Wilde characters. The Fan is one well crafted work that Preminger elevates by eschewing the easy task of filming a classic stage satire and adding a stark but unobtrusive contemporary sub plot that not only advances the storyline but in the true spirit of Wilde pays homage to his timeless words.